NASA’s Moderate Resolution Imaging Spectroradiometer, or MODIS, records what’s happening on the surface of the Earth every day or two. That means recording dust storms, hurricanes, typhoons—and, as was the case this week, a thick layer of smoke over California. This image was captured on Monday, and shows brown smoke drifting over the coastline of northern California—where multiple fires are burning right now. Most of these fires were caused not by humans, but by lightning strikes on July 30th, according to InciWeb. How can a state beset by drought have so much lightning? According to the California Weather blog, thunderstorms caused by “upper-level” moisture over the Pacific dropped a tiny bit of moisture but enough lightning to spur many, many new fires. It’s an unlucky even for a state already struggling with wildfire season. 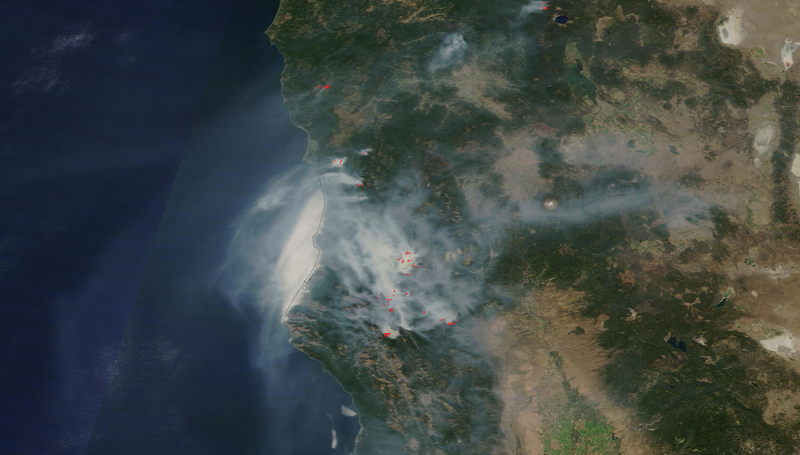 NASA actually maintains a specific site dedicated to images of “Fire & Smoke,” pulling high-res satellite data on areas of the West Coast and the world at large from MODIS. You can check it out here.